If you haven’t yet, do check out the winners of our WTP 2018 literary and fine art competitions, in last month’s issue. Our photography winner Alexander Klang graces our cover with one of his phenomenal analog images, and you can read about how he finds and photographs his subjects in our WTP interview. Cynthia Manick was our first place poetry winner, who talks about how she is a “compulsive word collector” in her interview with our poetry judge, Joyce Peseroff. Both are the recipients of the Elizabeth Sloan Tyler Memorial Award, a week in the Hamptons, in my mother’s home by the ocean. Klang is flying in from Germany, and Manick, an easy trip, the LIRR in from Brooklyn; I look forward to meeting them both, perhaps for a glass of wine on the deck, overlooking the garden and woods. Speaking of our judges, a final thank you to both Joyce and to Lauren Shaw, for not only their time and expertise, but for their truly careful consideration—the final pool of contestants was a competitive one, and both judges proved astute in their evaluations and thoughtful in their final decisions. What else you may have missed in October: Several virtual studio tours with WTP artists Monica Coyne and Andrea Rae–masters of two fascinating mediums, metalsmithing and fiber sculpture respectively; a couple of artists interviews, with photographer Sandrine Hermand-Grisel, who has been featured a couple of times in WTP, and Naomi Schlinke, whose beautiful ink works as well as her inked collages were featured in October’s issue. 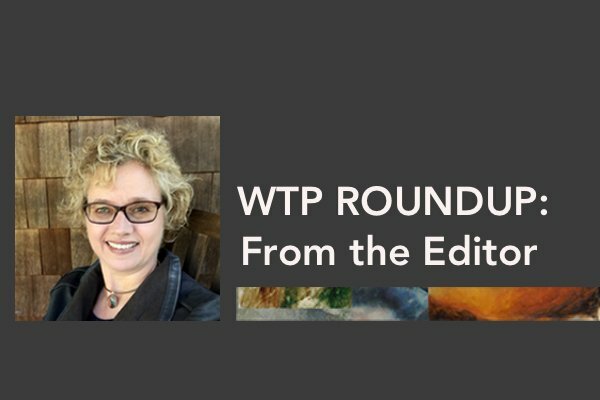 The holidays are almost upon us, but more in store for December: our fall art roundups from our WTP art correspondents out in the field! Until then, wishing you a peaceful Thanksgiving in this unpeaceful time and world; may we all find at least some reprieve in the literary and fine arts.